Gump says she looks forward to spending time with her crew and getting to know them better as brothers, while also getting good hands-on EMS and fire training. 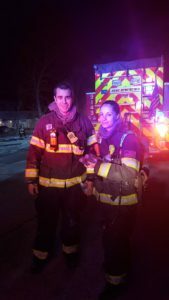 Gump received her bachelor’s in paramedic fire science from Lindenwood University before training at the St. Charles County and St. Louis County fire academies. She received her paramedic license from St. Charles County Ambulance District. She is also involved in the Firefighter Combat Challenge, and enjoys training with the department’s search & rescue K9 unit. In her free time, Gump enjoys hiking, horseback riding and spending time with family.